Unlike some of its more flavorful fellow winter squash, pumpkin does not start out packing a ton of flavor. It has a quite mild (some may say bland) taste without the mix of spices that make "pumpkin spice" everything so popular every fall. A layer of butter mashed up with sambal (or any other chile-garlic paste) adds a lot of oomph to wedges of roasted pumpkin. Obviously, this recipe doubles (or triples), if you’re so inclined, just be sure to keep the pumpkin in a single layer as it roasts. Preheat an oven to 375F and prepare the pumpkin: Halve the pumpkin from top to bottom, scoop out the seeds and stringy guts in the middle, and cut each half into quarters (you’ll have 8 wedges). Use a fork to poke holes all over each wedge (this step is key since the holes let the spiced butter seep into the pumpkin). In a small bowl, combine the butter, sambal, and salt. Taste, if you like, and add more spice or salt, if you like. Spread even amounts of the spiced butter on each wedge of pumpkin. 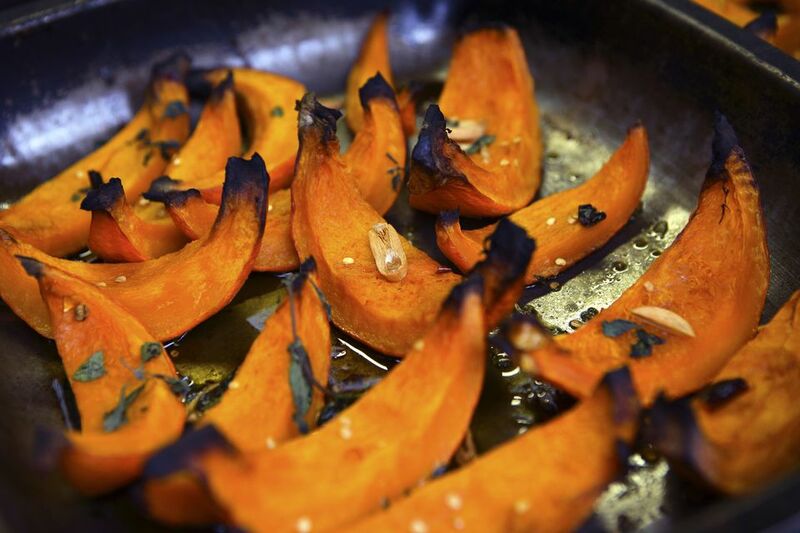 Set the pumpkin wedges, skin-side down in a roasting pan (you want them sitting in such a way that as the butter mixture melts, it melts into the pumpkin as much as possible), scatter on the garlic and/or thyme, if using, and cover with foil, and roast for 15 minutes. Uncover the pan and turn wedges on their sides. Roast 15 minutes, turn the pumpkin wedges on their other sides, and roast until the pumpkin wedges are tender and browned on their edges, another 15 minutes. Whirl 1/4 cup chopped and seeded fresh red chiles (Thai bird's eye chiles are commonly used) and 1 to 2 cloves of peeled chopped garlic in a blender or food processor (or be traditional and grind them in a mortar and pestle), add 1 to 2 tablespoons of fresh lime juice and/or palm sugar or brown sugar to taste, if you like; mix things up by adding a stalk of lemongrass (minced) or a bit of grated fresh ginger.